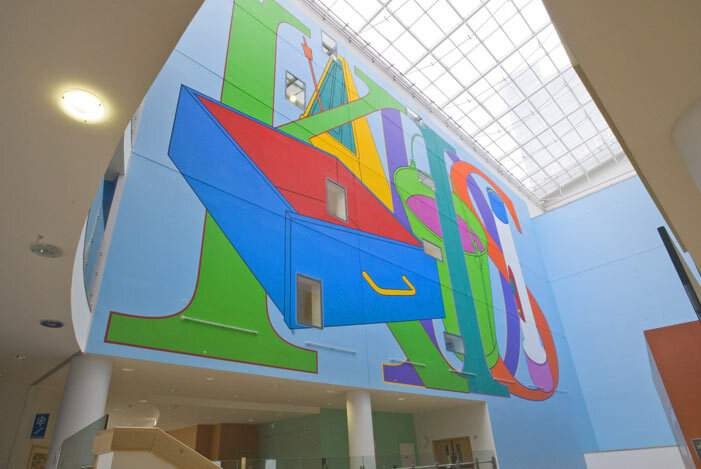 This five-storey wall painting was created by internationally renowned artist Michael Craig-Martin and designed specifically for the Community Atrium. He describes his thinking behind the work; "My principal aim has been to transform the bleak view from the windows of the children's wards facing into the atrium. The great height of the wall opposite has made it possible to create an image of immense scale, a highly coloured interplay of objects and giant letters spelling KIDS. I hope it will create a sense of pleasure and wonderment and act as a stimulus to the imagination of all, but particularly for those children confined to the wards, the only place where it will be possible to see the painting properly, at eye level and head-on." The journey to an operating theatre for surgery can be very stressful for a child and their parents. A photographic installation by the German artist Jan von Holleben, hopes to make this experience less traumatic for young patients at the Children's Hospital with artwork specifically designed to distract them from their fears. 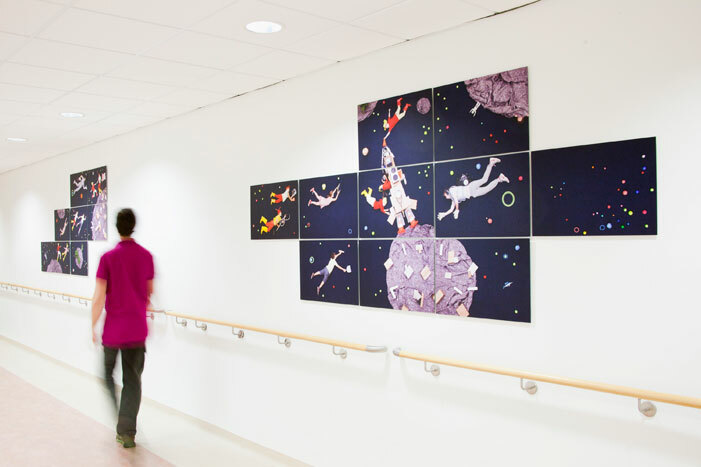 In Spring 2011, Jan was selected to develop new artwork for the two long corridors leading from the wards in the Children's Hospital to the operating theatres, as well as for the ceilings of anaesthetic rooms and recovery bays, and decorative screens. Last May, the artist spent a week as artist in residence in the hospital speaking to doctors, therapists, play specialists, nurses, anaesthetists, porters, patients and their parents to understand the experience of a patient's journey to theatre and to capture ideas from young patients. His dialogue with staff continued for a further two months to develop a proposal for the artwork. The final production took place in his studio in Berlin last August with the help of nine children. And so, the story of 'Lilly and Jonathan' was born - an installation made up of over 350 individual photographs creating more than 40 composite panels. The series tells the adventures of two friends, Lilly and Jonathan, who go on two fantastic journeys. In the first they leap across the countryside and use their magical powers to fly into space; in the second they dive underwater without any effort or special equipment to discover a magical undersea world. Along the way Lily and Jonathan meet other children and together explore an exiciting dreamworld of galaxy games and underwater dances. 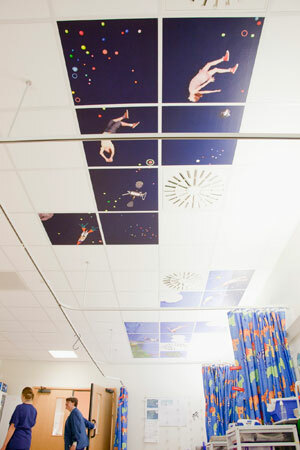 The panels are installed in the corridors between children's wards and hospital theatres, on the ceiling of all anaesthetic rooms to distract children and adults just before they go through for surgery. This way, the children can drift away into fantastic stories as the anaesthetic takes effect. Further images are installed on the ceilings of recovery bays and on screens dividing bays to engage patients as they come round from surgery. This project has been entirely funded through charitable donations for art projects from Firefly Tonics, the Fund for Children, the League of Friends and supported by Kwickscreen. Helen Care, Clinical Psychologist at Oxford Children's Hospital, said: "The images are so useful to me in my work with children when preparing them for theatre. "I often work with more anxious children in my role as psychologist with the cleft and craniofacial surgical teams and co-ordinate with the play specialists in helping children manage the process of going for procedures. "Having the pictures to talk to them about the help prepare them and normalise some of the process is brilliant. "I also think the stories Jan has chosen to tell, of children going off on a journey which can so easily mirror the child's own journey into the anesthetic room, is a lovely way of helping children to construct their own stories about the process they are going through."